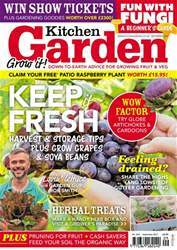 This month - Keep fresh, harvest and storage tips plus grow grapes and soya beans. Wow factor - Try globe artichokes and cardoons. Feeling drained? Share the highs (and lows!) of gutter gardening. Herbal treats - make a handy herb box and visit a grower's paradise. Fun with fungi - a beginners guide. Plus pruning for fruit, cash savers, feed your soil the organic way and fantastic exclusive videos in our custon iPad edition.